October 12, 2011 - Eclipse Aerospace announced it is now taking orders for the Eclipse 550, the new twin-engine jet model in the Eclipse Jet family. The Eclipse 550 will be a technologically advanced, twin-engine jet aircraft with a design that utilizes the same airframe and power plant as the popular EA-500 model. Along with significant innovations in most aircraft systems designed to improve overall operations, direct operating costs, technology, comfort, and performance. ?We?re thrilled to be taking this positive step forward in Eclipse history,? said Mason Holland, CEO and Chairman of Eclipse Aerospace. ?We expect a robust customer response based on the support we?ve received from current Eclipse owners, our suppliers and the aviation community in general. Ultimate production and production levels will be driven by overall market demand, and we couldn?t be more excited or optimistic.? The Eclipse 550?s enhancements will include expanded aircraft computer systems and integrated avionics package, which will now support features such as Synthetic Vision, Enhanced Vision, dual-mode FMS, TAWS, TCAS-1, ADS-B, on-board color radar, Radar Altimeter, and iPad data entry integration. 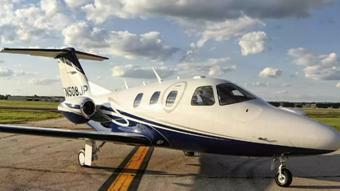 The base price of the Eclipse 550 twin-engine jet is USD $2,695,000 (2011 value). Eclipse Aerospace expects to produce 50 to 100 aircraft per year with deliveries beginning in 2013. In addition, Eclipse Aerospace will become the first in its industry to offer Auto-Throttles as an option for the Eclipse 550. ?One of the true values of the Eclipse 550 design is the ability to incorporate new technology such as Auto-Throttles into our aircraft with improved cost efficiency,? said Holland. ?The Eclipse 550 will also include performance enhancements to further improve the aircraft?s fuel efficiency advantage over competitors.? Innovative Solutions & Support, provider of the EFIS portion of the Eclipse 550?s integrated Avio FMS avionics package, will continue to provide engineering and design services in the development and certification of Synthetic Vision, Enhanced Vision, and integration of Auto Throttles. All of these features will be supported by a new generation of flat panel displays with enhanced graphics and robust microprocessors, all tested to the more rigorous standards normally applied to military aircraft. The Eclipse 550 will be powered by the same Pratt & Whitney PW610F turbofan engines used in the EA-500, which collectively produce 1,800 lbs. of thrust. This gives the 6,000 lb. Eclipse Jet a maximum cruise speed of 375 knots and an IFR range of 1,125 nm with a full fuel payload of 700 lbs. Like the EA-500, the Eclipse 550 will have a maximum service ceiling of 41,000 ft. and a cruise fuel flow of only 59 gal/hr. ?Eclipse is in a place all to itself. First, the cost to operate an Eclipse Jet is significantly lower than the next closest jet in our class. Couple this with the low purchase price entry point for the Eclipse 550 and you have a winning combination,? Holland said. A limited number of introductory position holders will receive a contract without CPI escalation and, as an additional incentive, over $120,000 in optional equipment at no additional cost.